I cannot stop making more amigurumi. 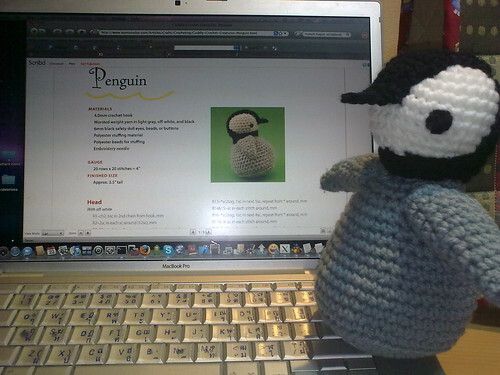 I made more koalas and penguins from cuddly crochet creatures patterns. I once wonder why people like to make this amigurumi things? I ignored all the beauty of amigurumi, but now…I don’t know how to stop and I even don’t want to crochet other project than amigurumi. The good thing about making amigurumi is: I don’t make pile of work-in-progress. I can finish the project in no time and I don’t get the chance to be bored. Thanks for your visit and your comment. The language on my blog is portuguese, the official language in my country Cape Verde (small archipel on the western coast of Africa). About your question: I havenÂ´t tried all the yarn yet but I made some winter items with the petroleum blue yarn with black sparkles and I loved working with it. The magazines are very nice and full of graphics (they are written in Thai) so I will be able to work with them too. 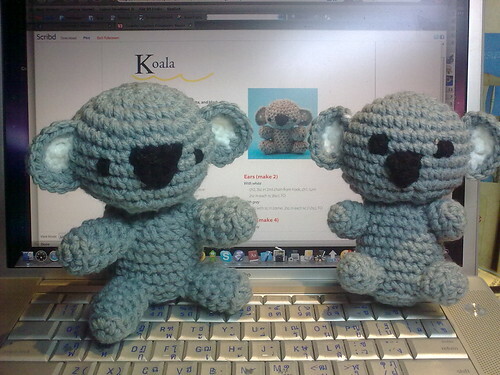 I love your amigurumiÂ´s, specially the Koalas they are very very cute. Hugs and keep crocheting nice things. This is a Flickr badge showing public items from Yohanes Nugroho tagged with crochet. Make your own badge here.